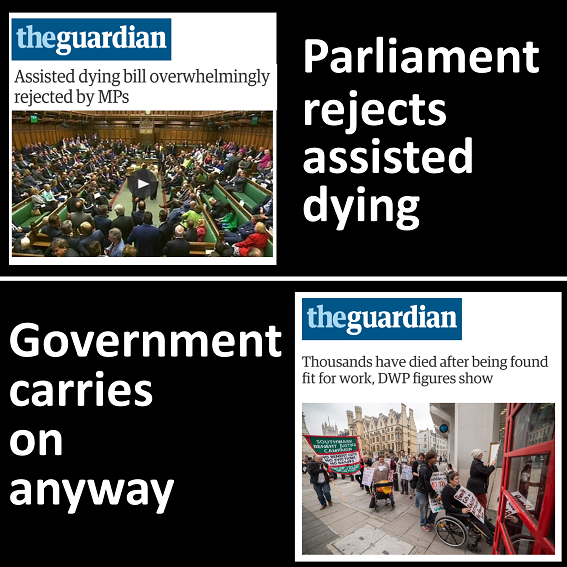 Today MPs voted overwhelmingly against changing the law to allow the terminally ill assistance to die. Meanwhile, people who want government assistance on dying could try claiming illness and disability benefits through the Department for Work and Pensions (DWP). According to figures just released (that the government didn't want us to know) nearly 90 people die every month after being found fit to work, many of them within two weeks. Between December 2011 and February 2014, almost 2,500 people died after their claim for long-term illness benefits was suddenly stopped after they were deemed fit enough to work. The new data didn’t provide the causes of the deaths. Many committed suicide. Over half of people deemed fit-to-work win on appeal; after the long and daunting appeals process, they are eventually assessed NOT fit to work. Many die waiting for their appeal to take place. The arduous, complicated appeals hearing has to be heard by a doctor and a judge, with some claimants needing legal representation. Commented Guardian journalist, Frances Ryan, “Death has become a part of Britain’s benefits system. Welcome to the first fully fledged Conservative-run Britain of the millennium. Isn't it time politics grew up?